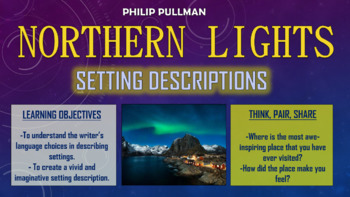 Northern Lights (The Golden Compass) - Setting Descriptions! 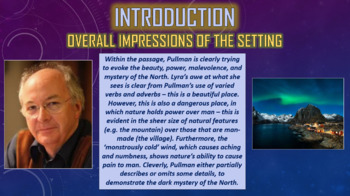 This engaging and informative lesson enables students to make precise interpretations of the descriptive language used by Philip Pullman in his descriptions of settings in ‘Northern Lights.’ They also learn how the depiction of settings can have a profound impact upon the tone and atmosphere of a novel, and apply this understanding (along with their knowledge of the key language devices) to form their own vivid and imaginative descriptions of places. 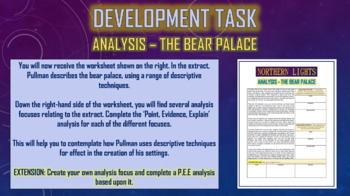 There are also opportunities for group learning, speaking and listening, peer assessment, and whole class discussion.